The Rev. 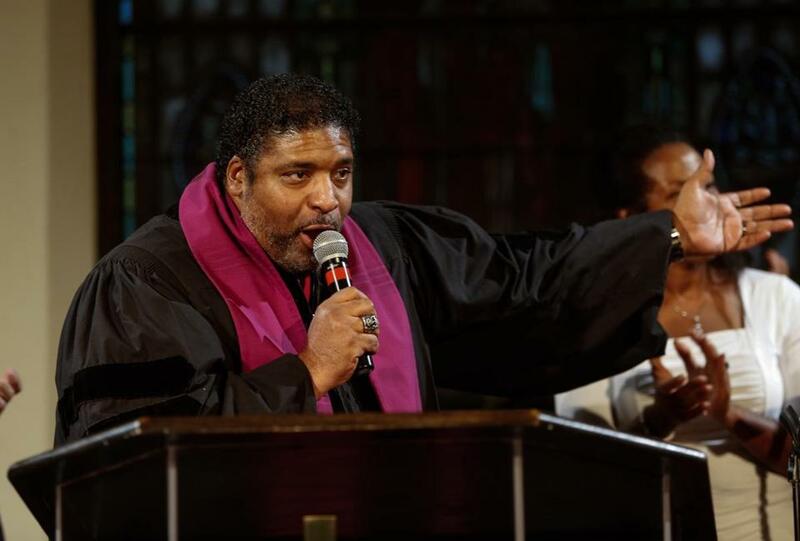 Dr. William J. Barber II spoke duing a revival service at Bethel AME Church in Boston on Monday. On the heels of his rousing speech last week at the Democratic National Convention, the Rev. Dr. William J. Barber II led hundreds of people Monday evening at the Bethel African Methodist Episcopal Church in a wide-ranging service focused on inequality in America. A North Carolina political leader and NAACP national board member, Barber was part of a slate of faith-based speakers that painted a portrait of a troubled nation with a political climate that is dividing the country. During the program, several local residents delivered emotional accounts on income inequity, environmentalism, access to education, and criminal justice. “You and I will not be able to go away from this place and do business as usual,” said Barber, who emceed the program. “When religion is used to camouflage meanness, we know we have a heart problem in America,” said Barber in the Wells Fargo Center. Barber’s Boston trip marked his seventh stop in a months-long national tour called, “The Revival: Time for a Moral Revolution of Values.” Barber and the others on his tour created a petition to call on the 2016 presidential candidates, US Senate candidates, and governors to stand against racism, poverty, and hate. As of Monday evening, the online petition had garnered more than 8,000 signatures. Joining Barber at Bethel Church were the Rev. Dr. James A. Forbes Jr., who brought audience members to their feet with a biblical story, and Sister Simone Campbell, leader of the “Nuns on the Bus” organization formed to promote social justice, who recounted stories of inequality from their trips across the country. Before the service, a line of people snaked around the Jamaica Plain church and down a hill, waiting to get seats. Many attendees stood outside during the program, which was also live-streamed. The service opened with several upbeat worship songs, led by a group of singers who travel with Barber. Near the end of the service, after local speakers had finished, Barber asked the crowd to respond. Meg Bernhard can be reached at meg.bernhard@globe.com.